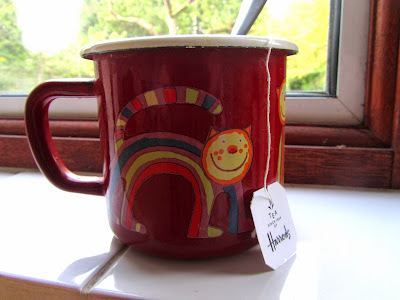 The Readathon is important to me, for all the reasons I tried to explain in yesterday’s tribute to Dewey at the official Readathon blog (while I’m at it, let me also point you towards this post I wrote along with Debi, Chris and Renay for BBAW 2009). It feels like a lifetime ago, but I remember the first readathon so vividly. It happened while I was in Nottingham for my undergraduate year abroad, and although I didn’t sign up as a reader, I ended up spending most of the weekend cheerleading and having fun with people who would become very good friends of mine. This is actually the first time I get to participate in the Readathon in a very long time, and I can’t tell you how much I’m looking forward to it. I was looking forward to reading in the garden for a bit, but the weather turned grey in the past few days, so it looks like this Readathon will be strictly an indoors affair. Naturally I don’t expect to get through all of these, but it’s good to have lots of options. 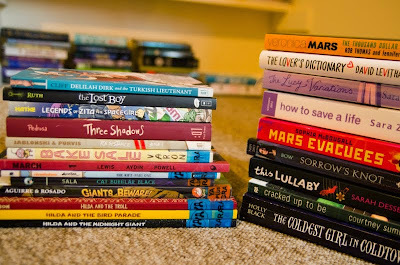 I have a comics stack, a children’s books stack, and a (mostly) YA and SFF stack. As for what I’m looking forward to the most, argh, hard — so many books I’m really excited to read. I’ll probably be starting with Gene Luen Yang’s Avatar: The Last Airbender - The Rift part 1 — a quick read with characters I already know and love. 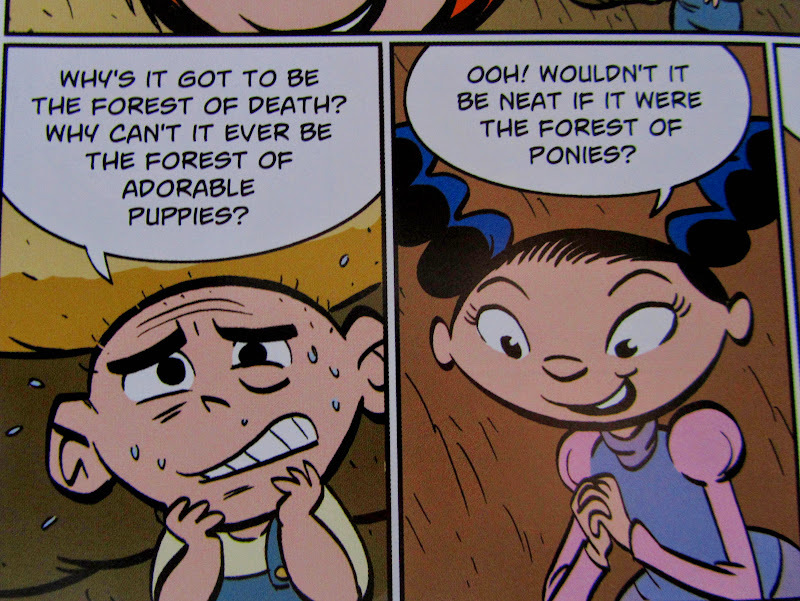 I’m also really looking forward to the Hilda books by Luke Pearson. Moving on to the next stack, I really want to read my long overdue first Courtney Summers, Cracked up to Be, and also some Sara Zarr, because Jenny reminded me of how much I love her. Lastly, I’m dying to finally read Erin Bow’s Sorrow’s Knot. 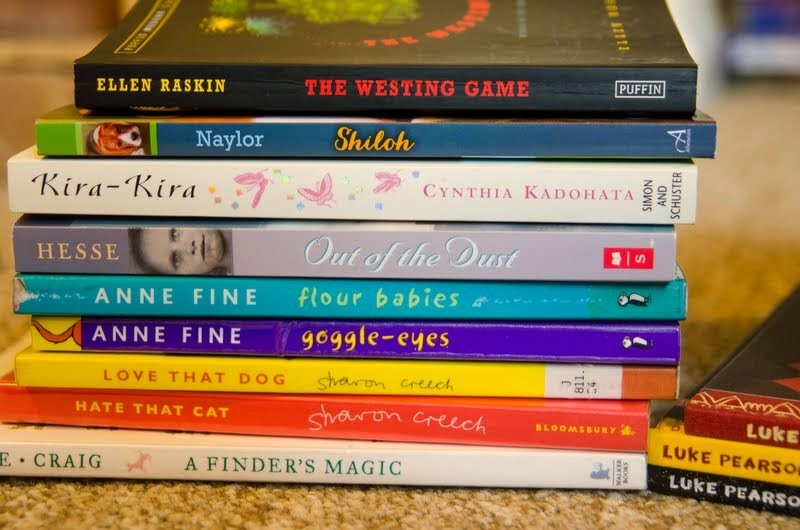 As for the children’s stack, Sharon Creech’s Love That Dog will probably be the first one I reach for (I blame Debi, who posted the opening line the other day). Grapes, carrots, cucumber, pita chips, olives, parmesan and basil biscuits, and plenty of hummus. I also have pasta salada for lunch, and I’m planning to throw together some quick gnocchi and pesto for dinner. There’s some leftover Easter chocolate to keep me going; and last but not least, I have plenty of coffee. I’m Ana, I’m ancient in blogging years (seven and a bit), I’m Portuguese but live in the UK, and I work for a large public library system. I love reading (obviously) and tend to favour fantasy, kid lit, the Victorians, non-fiction (especially science, social history and gender studies type stuff) and forgotten classics. Thank you so much to everyone who stops by with encouraging comments today — the Readathon wouldn’t be the same without all you awesome cheerleaders, official and unofficial. Things are going well so far. I started with The Rift by Gene Luen Yang; as I predicted above, revisiting a world and a group of characters I love was the perfect way to start the Readathon. 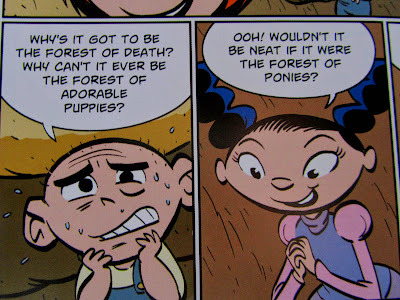 Then I moved on to the adorable Hilda comics by Luke Pearson, and during hour three I read Sharon Creech’s novels in verse Love That Dog and Hate That Cat (I loved them and they made me cry a lot. Probably a book about someone losing a beloved yellow dog wasn’t the best choice for me right now). Having boosted my sense of achievement with short stuff, I moved on to a full-length novel, and am now about two thirds of the way into Cracked Up to Be. Read so far and currently reading. To any fellow Readathon participants reading this, how are you doing? Since my last update I read the rest of Cracked Up To Be by Courtney Summers and The Lover’s Dictionary by David Levithan, plus I started Bake Sale by Sara Varon, another adorable comic. 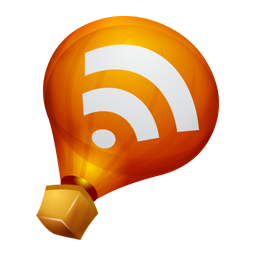 I also stopped for dinner and took half an hour or so to visit other readers’ blogs. 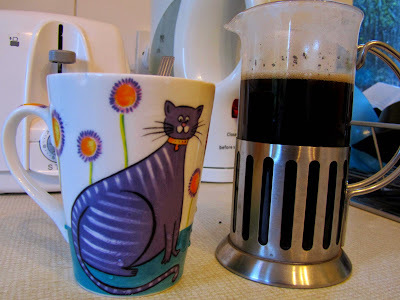 I’m starting to get tired and I’m currently considering coffee, though part of me worries it would make me too awake. I’ll be staying up to make sure my Hour 13 Mini-Challenge posts, but after that the plan is to get some sleep and then get up early on Sunday for a few more hours of reading before the finish line. We’ll see how it goes. How’s everyone else holding up? I finished Bake Sale and started The Westing Game, but even after a cappuccino I’m finding it hard to stay awake. I’ll try to read a few more chapters before calling it a night, but I figure it’s better to get some sleep now and wake up nice and early tomorrow so I’m around for the final stretch of the Readathon. If I don’t update or tweet again, I’ll see you all in a couple of hours! I’m definitely not quitting and hope to get a good amount of reading done tomorrow morning. Good morning! I didn’t get much further into The Westing Game last night, but I’m up now and ready for another six hours of reading. Thank you so much to everyone who took part in my Hour Thirteen mini-challenge while I was asleep — I had a ton of fun going through your entries just now. Early morning sky — it looks like it’s going to be a sunny day, but probably still too chilly to read outside. Yes, I have a lot of cat mugs. I expect this will be my last update until the End of the Event Meme. Since I last checked in I finished The Westing Game, read Giants Beware! (another delightful comic), and also read one more novel in verse, Out of the Dust (it was really good and it made me want to finally get around to The Grapes of Wrath). Now I’m starting my final Readathon book, Sorrow’s Knot by Erin Bow. I don’t expect to finish it, but it will be good to get started on a book I’ve been really looking forward to for the last couple of hours of the Readathon. I got really sleepy again around 8am, so I made myself some black tea. I have a feeling I’ll be having a nap at some point this afternoon, though. I missed the Shelfie Mini-Challenge earlier on, but here’s one anyway. Here I am with my final book, rocking the bags-under-my-eyes look. From Giants Beware!. I didn’t pick this many adorable comics for the Readathon on purpose, but I guess it was a good thing I had them at hand to make up for all the books where the dog dies (sob). I may pause for a snack soon — breakfast feels like ages ago — but other than that, I’ll be reading until the finish line. Hours 21-22 were hard. I got up at 5:45 in the morning, and even though I got a reasonable amount of sleep at night, between 8 and 9 in the morning I was nodding off again. Black tea helped, though, and other than that I was fine — I think my strategy of going to sleep at a reasonable hour and then getting up early on Sunday for some more reading works really well for me. There were a lot of comics and novels in verse in my stack, and those proved excellent Readathon choices. I flew through Love That Dog and Hate That Cat by Sharon Creech and Out of the Dust by Karen Hesse. Giants Beware! (comic) was also an excellent choice; and if I hadn’t read them before, Monster on the Hill or Jane, The Fox and Me would have been perfect. That looks far more impressive than it is because of the aforementioned comics and novels in verse. 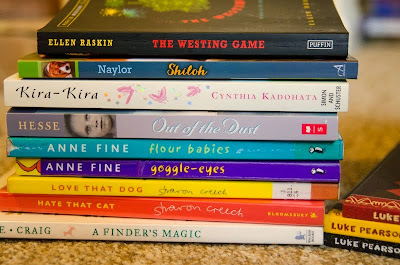 Some of those were extremely quick reads, but that’s what works for me during the Readathon. Which book did you enjoy most? Which did you enjoy least? 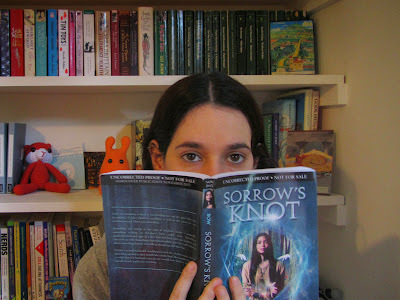 I’m totally in love with what I’ve read of Sorrow’s Knot so far, I loved the two Sharon Creech novels, and I know that Cracked Up to Be will stay with me for a very long time. As for my least favourite, I guess it’s Bake Sale. It was really sweet, but not quite as memorable as the other books I read. How likely are you to participate in the Read-a-thon again? What role would you be likely to take next time? I’ll be here every time, as long as the Readathon doesn’t fall on a weekend when I work (that had been the case for the past few editions). And I’ll be a reader again, because setting aside some solid hours for reading and getting all these books off my TBR pile in one day was really satisfying. Also, even though I didn’t official sign up as a cheerleader, using some of my breaks to visit other readers’ blogs or to cheer them on on Twitter made the Readathon much more fun, so I’ll be sure to do that again too. Thank you so much to everyone who stopped by to cheer me on, chatted with me on Twitter, and generally made the Readathon such a fun shared experience. I hope to see you again next time! 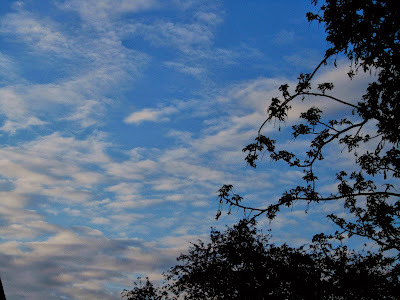 I haven't been blogging for ages, but I continue reading your blog and others, and I wanted to thank you for your tribute post to Dewey, it was touching (plus, I didn't know it was possible still to read some of her blog online, thanks for the link!). I'm a Readathon newbie, it hasn't even started yet, but I am getting so many ideas. I'm glad they encourage us to visit other blogs. Thanks for the single-post idea! Ana!!! I'm envious of your snacks - lol. Everything looks so fresh and tasty. Very organised - I feel quite shamed. You wrote such a very lovely tribute post and I am so pleased to be taking part again as it's been too long. Okay, why the hell am I crying?!! 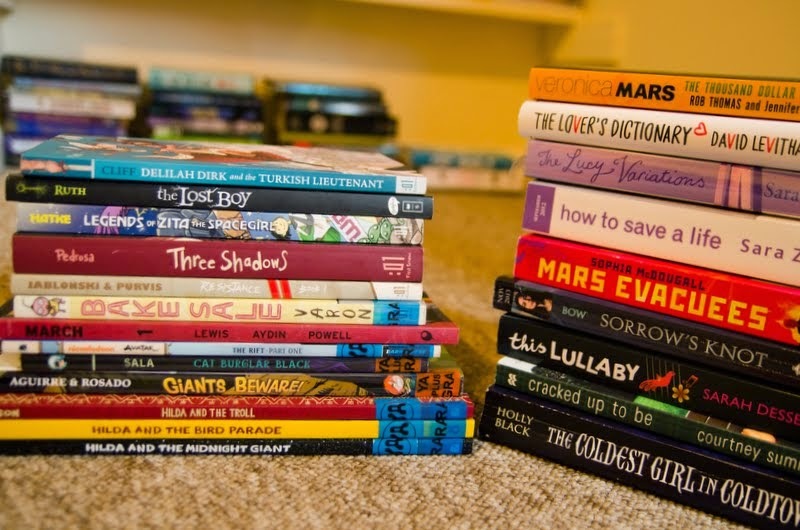 I love your book pile!!! 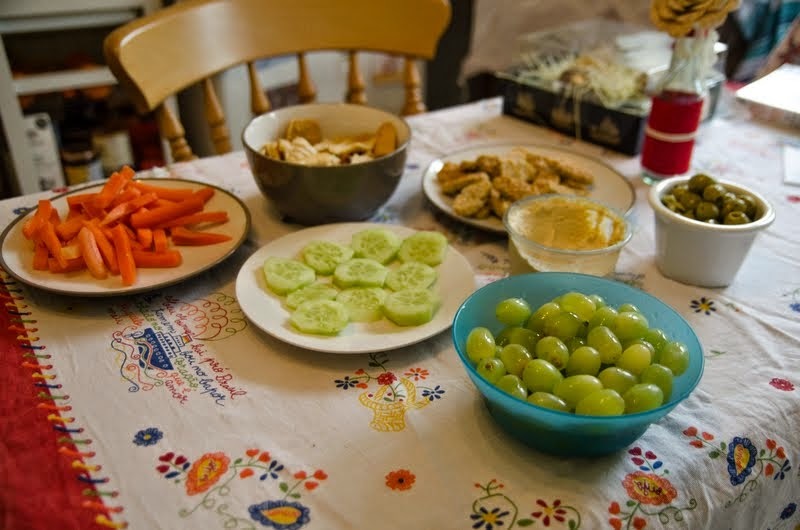 And your snacks (well, except for the olives *shudder* :P ). I would probably have a large desire to nap if I read in that bean bag though. I'm so sorry you won't get to read outside at all--same here, cold and wet and dreary. Have ever so much fun today, Ana!!! I just can't put into words how happy it makes me that you're doing this...honestly, my heart is just so overjoyed. Love you!!! 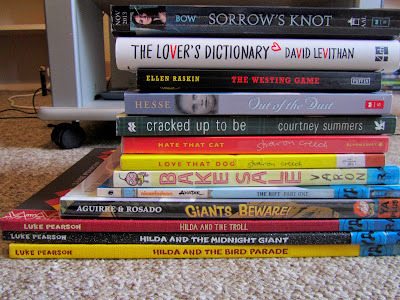 Hooray readathon! You have such an impressive array of books and snacks to choose from! Have fun! Happy readathon day Ana! Both your stacks of books and snacks look incredible! I love all of the history behind the readathon. Each year I participate I feel even more a part of this wonderful community. Happy Readathon Day! I am once again working on Readathon, so can't participate, but am trying to visit a few other readers like you :) Your bookstacks and snacks both look great -- have FUN today! 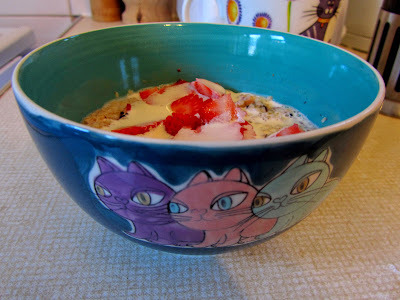 From one ancient blogger to another, that lunch looks delicious! Can you believe how long we have continued to do this? Just checked my first post at original Tip of the Iceberg blog and it goes back to 2006! 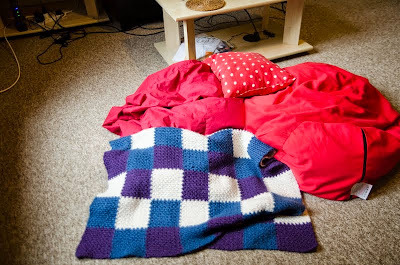 Ooh, is that the Battlestar Galactica-Ana Blanket? Awesome cat mug! And I have a big bowl of grapes to snack from as well. Forgot to get cucumber though and seeing yours makes me want some :( But hey, can't complain 'cause I'm sitting here with a glass of prossecco wine! Have fun reading! I need to try my first Courtney Summers book as well! You have lots of yummy looking snacks there...I hope you get the chance to eat them all :) HA! I hope that you are having a WONDERFUL read-a-thon filled with lots of good books. Awesome reading and so much planning! I'll have to take a leaf out of your book for next time. Have you got any green tea? I find that's a good alternative to full blown caffeine, and it'd keep you awake just long enough. I love your cat mug! I'm glad you're joining us and thanks for cheering! Is that your garden? It's sooooo lovely!!! I just can't get over how many books you've read! Did you enjoy The Lover's Dictionary? Good luck staying awake! And lots of hugs, just because I love you!!! Ana, yours is one of my all-time favorite blogs and I am honored to be cheering for you today. Although you don't seem to need any cheering, judging by how well you are faring :) You've read a lot in these 9 hours. Way to go! Definitely get some sleep if you need to! And hooray for reading the Lovers Dictionary! I love Levithan so so much :) Wow, your yard/garden is so very beautiful :) My mind is blown at how awesome you've been doing with this readathon! Love you! I hope you are having a great read-a-thon! Keep up the great work, #TeamWordsworth! Sleep well, Sweetie! I'm going to catch a few hours too. See you in the morning. Sweet dreams! I think I read The Westing Game for the last read-a-thon! I liked it a lot and wished I'd discovered it as a kid. Hope you are able to get some more reading done tomorrow! I missed your gnocchi earlier. Now I want gnocchi. Uh oh. Nth at was me, Heather. I forgot I wasn't signed in! Oops. Best part of this read-a-thon: getting to do this with you and Chris again!!! Other fun tidbits: too numerous to list. So happy you had so much fun, and had such awesome reading experiences. And so many reading experiences. :P I do think I miscalculated by reading a longer book (for me) as my second choice. I only even put a couple of longer books in my pile because I *knew* they weren't the smartest choices--and then I went and read one of them anyway. If I wasn't such a slow reader, I'm sure it wouldn't have mattered so much. Ah, but honestly, I don't care--I just had so much goshdarn fun and that is really the bestest thing of all! It looks like you had a fantastic day of reading and I hope it lived up to your excited expectations! I also appreciate the fact that I can get up and continue reading - I actually carried on reading past the designated hour to finish, so it works really well. I didn't manage 5:45 though - I'm impressed! I think I'd have dropped right back off to sleep. I hope you can participate more often again for the next ones! Your snacks are so healthy! I love your pictures, too. Sounds like you had a great Readathon. Thank you so much for stopping by, everyone! I had the best time, and your comments and encouragement were a huge part of why. I'm late with reading your post for the reading challenge, and I'm sorry! I meant to get back to following people who were participating and cheering, and I got sidetracked. I loved your post! 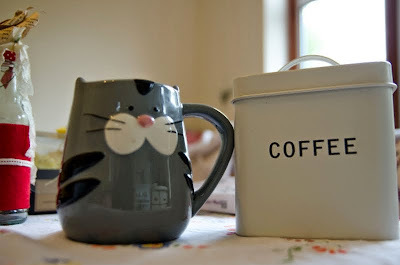 All those cat mugs :-) and tea and what fun books you read. I like that idea of sleeping for part of the night, too. I am planning on doing this next year, as my kids are finally old enough that they let me read for hours :-) at a time now. Congratulations on completing another readathon, Ana. And can I ask what roses those are you have in your garden? 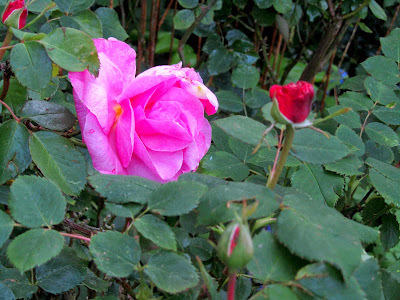 Not only am I delighted you have some, but am curious what kind - I love roses, and have 4 different kinds in my garden so far.